Thailand jewelry manufacturers produce a wide range of antique look marcasite jewelry such as: silver marcasite necklaces, marcasite bracelets, silver marcasite rings and sterling silver marcasite earrings. Marcasite is the white form of fools gold. Originally the name marcasite was given by mineralogists to an unstable form of iron sulphide crystallizing in the rhomibic system, but the marcasite found in jewelry today is crystallized in the cubic system. Marcasite Jewelry was made popular in Victorian jewelry and remains popular today adding an old world quality to modern jewelry. Marcasite Jewelry is the combination of sterling silver and marcasite (white iron pyrite). 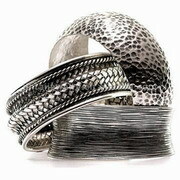 You can find Marcasite Rings and assorted other Jewelry made with Marcasite. Jewelers usually describe marcasite as a bronze color, its designs usually resembling an “Art Deco” period. 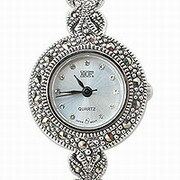 You’ll generally see marcasite jewelry shining with a vintage estate look. Bangkok Companies is a full service product sourcing company in Thailand. For All your Marcasite Jewelry needs please email bangkokcompanies@gmail.com with your requests. Bapna International Co. Ltd, is biggest Manufacturer of Thailand and we are Manufacturing all kind of Silver Jewelry. We guarantee every piece of silver jewelry we sell meets or exceeds industry standards for sterling silver purity. Silver Source's quality control standards require that all manufacturers' products routinely submit to assay-testing for solid, consistent 925 sterling silver purity. We offer a variety of guaranteed 925 sterling purity for our wholesale jewelry resellers. While fashion trends come and go, silver jewelry remains a classic addition to any wardrobe. Simply said, silver jewelry never goes out of style. This is why wholesale silver jewelry is such a tremendous business. Established in 1996 is one of the forefronts Sterling Silver Jewelry Manufacturer and Exporter in Thailand. With customers from all over the world, we are well known for our high quality products and excellent services. At HB1, we work exclusively with 925 sterling silver. Our product categories include Rings, Earrings, Pendants, Bracelets, Jewelry set, Silver fashion pen and many more. We specialize in electroforming process in sterling silver. Over 30 years of experience in silver manufacturing in Thailand. Big look but light weight and we have over 1,000 styles in earrings, pendants, bracelets, bangles etc. We sell by the gram and also by piece. Production:300-500 kilos per month. Mitsairoong Company is a manufacturer of fine gold jewelry, sterling silver jewelry, marcasite jewelry, Gemstones jewelry, Diamond jewelry and Greek jewelry. We offer a high-quality product and most competitive price to our customer. We would like to introduce ourselves as manufacturer and exporter of Sterling Silver 925 Jewelry from Thailand. Our product range from ring, bracelet, earring, pendant, bangles, toe rings, pill box and etc. We can manufacture products according to the designs and specifications provided to us. We accept minimum order of 25 pieces / 25 pairs. We can finish all our product in High Polish, Rhodium Plated, Anti Tarnish, Sand Blast, Oxidized, Gold Plating in 2 or 4 microns and Marcasite Jewelry. Products: Our product range from ring, bracelet, earring, pendant, bangles, toe rings, pill box and etc. We can manufacture products according to the designs and specifications provided to us. Oriental Arts & Crafts Ltd.
A leading Thai designer, manufacturer and exporter of sterling (925) silver jewelry for both men's & women's. Oac manufactures the most impressive diversity of styles and designs in both plain and mounted with semi-precious and precious stones-diamond, blue topaz, amethyst, garnet, peridot, marcasite, crystal, synthetic opal, MOP, pearl, amber, cz, black onyx, turquoise & etc. We are "Pasita Ltd. Part", the supplier of all kind of 925 Sterling silver jewelry; rings, earrings, necklaces, bracelets, pendant and brooch with competitive price. We have the wide range of product with various design & styles of plain silver jewelry or jewelry which made with the design of Marcasite, Onyx, Turquoise and Mother of Pearl. Rollings jewelry is based in Bangkok Thailand. We are manufacture and wholesale silver jewelry includes plain silver jewelry, silver ring, silver pendant, silver bead, silver earrings, silver bracelet, silver necklace, silver chain. The designs come with semi-precious stone, cz, crystal, mop, marcasite or wood. We are 925 sterling silver jewelry manufacturer and trader from Thailand. We are in this business for over 20 years. Our major customers currently are in USA. 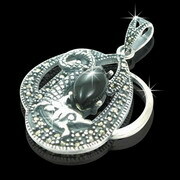 Our product ranges mainly are covered 925 sterling silver with marcasite, cz, pearl and so on. Moreover, fashion jewelry (with leather chain, natural chain, shell, various kinds of stones, etc) is also another product group we have offered to Asian markets. As supporters and wholesalers, we welcome any visitor inquiries to our factory and showroom. Bangles, bracelets, earrings, necklaces, pendent, purses, rings, and toe rings in finest quality of sterling silver, and marcasite, are available in various styles, designs, and collections. Modern lines and contemporary tastes, influenced by current trends in fashion, characterize these collections, which are designed in house and manufactured by machine. Our items are targeted at medium to upper level markets and distributed at the wholesale level through agents and major trade shows. We are manufacturer & wholesaler of 925 sterling silver jewelry with cz, mop, marcasite and more in Bangkok Thailand. We make to order as customers approval at competitive price and quality.